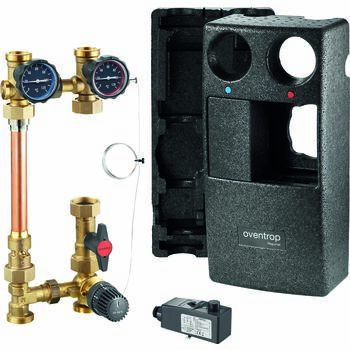 OVENTROP-Boiler connection system "Regumat F-180"
Fixed value control unit "Regumat F-180" for flow temperature control and limitation in combined radiator/surface heating systems. The flow temperature is controlled with the help of a three-way mixing valve in combination with a temperature controller with immersion sensor. With universal thermal insulation of modular construction and stainless steel/bronze pump.